BLACK JACK * INDIANHEAD * WHITE CAP * Mt. ZION just a short drive from PHLodge. Powder Hound Lodge looks out at Big Powderhorn Mountain Resort with the new Gun Barrel Lodge (pic above) and FREE SHUTTLE around the charming Bavarian inspired ski village. Family friendly Big Powderhorn offers exceptional ski school, special events including New Year's fireworks and Torchlight Parade, spring fling and Ski for the Cure. Ski nearby Black Jack for 4 award winning terrain parks, new features and exceptionally groomed and ungroomed trails, groves and fun terrain. Lumberjack Bar & Grill offers specials and themed weekends. Indianhead, offers events and family friendly atmosphere complete with bar, restaurant and full fitness facility and pool area. Mt. Zion is owned and operated by Gogebic Community College and is open to the public. The college offers a program for ski area management, downhill skiing and a tubing park. 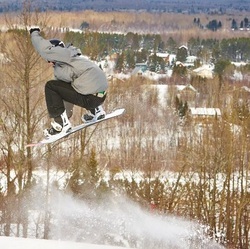 Whitecap ski area boasts 3 hills in one - great skiing in fresh powder and is close by. 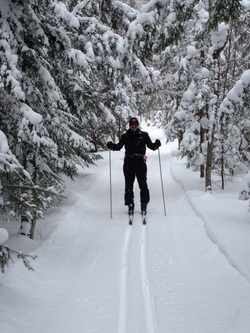 Nordic skiing in the Western U.P. is spectacular. Consistent snow, exceptional grooming and gorgeous scenery. Wolverine Trails are the closest trails to PHLodge and beautifully groomed for classic and skate skiing with a trail head at the top of Big Powderhorn Mt. as well as a short drive down Powderhorn Road. YooperBeiner snowshoe race in February (see events page). Tuesdays at 6:00 - meet at warming hut at main trailhead off Hwy 2 for group xc skiing. Shomberg Park Showshoe Trail - Located on the west side of Hwy 51 in the town of Oma, the 160 acres of Shomberg Park between Hurley and Mercer offers showshoe trails for all ages and skill levels. Two loops, each about .85 miles totaling 1.7 miles. The trail has easy, well marked terrain. 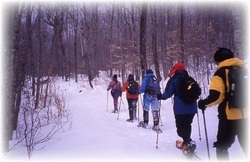 Wolverine Trails just out PHL front door offer snowshoe trails as well as stunning xc ski trails. Mt. 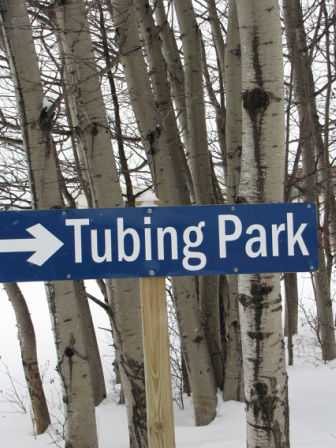 Zion at Gogebic Community College campus offers a tubing park for the community. All ages welcome and a welcome activity for little ones who may not endure the entire day boarding or skiing.